Today’s post was written by Sam Hohman. When I was in Bible College he was part of the staff and one of his more obvious roles was worship leading. I greatly respect Sam and believe that we share a similar heart for worship. He wrote this post for his Facebook account. When I asked if I could repost it here he was gracious enough to allow me. Sam currently serves as Worship Pastor for Faith Memorial Church in Sandusky, Ohio. I am reading today out of Leviticus 22:17 and on… and the online verses sent to me from www.biblegateway.com entitle this section: “Unacceptable Sacrifices”. It describes specifically what kind of animal must be brought as a sacrifice (a “freewill offering” or to fulfill a vow) – one without any defect, and a male (and it describes the possible defects). Those of you who, like me, grew up in a church that was Assemblies of God or similar, probably remember the song way back in the 80’s, “We bring the sacrifice of praise, into the house, of the Lord; we bring the sacrifice of praise, into the house, of the Lord! And we offer up to You, the sacrifices of thanksgiving; and we offer up to You, the sacrifices of joy!” Admit it. You just sang that in your head. And you also did the motions in your head. Come on, you know you did… you may have even continued in your mind to “This Is the Day” or “What a Mighty God We Serve”. If so, man, were you an A/G person! You can stop grinning now, ‘cause you are the one I’m talking about, you know who you are. I know that in Leviticus, the instructions given by God were not referring to worship and praise, especially not as we practice it today, with music, usually at the beginning of our church services. But the word “sacrifice” got me thinking, and, more specifically, “unacceptable” got me really thinking.A question popped into my brain: What would be considered an “unacceptable sacrifice” with our worship? And, I am being specific here, I actually mean, when we get together and have music that we sing, normally, the beginning 1/3 of our services. If you are like me, you can remember times that you went to a church service, saw a lot of people “entering in” (meaning, participating, being “demonstrative” as the songs were led), but you just did not feel it. I mean, I know what it feels like to not want to sing, raise my hands, “enter in” at all. (Shhh, don’t tell anyone, but there have been times I was the guy leading the songs and I felt that way…) Maybe you also have seen people really get into the worship, really smiling and praising God, but you knew how they were behaving the other 6 days of the week, and it was anything but Godly. But let’s say that when I had those times, I decided to just ignore how I felt and make myself “get into it” anyway. Ah, forget how I feel, man, I will raise my hands anyway, sing louder, close my eyes, whatever. Would that be an “unacceptable sacrifice”? I mean, because I really wasn’t “into it”? Would I be acting fake? Would I be a phony? Would people look at me and think everything was great with my life, between me and God when in reality it wasn’t, so I was lying to everyone? What is “unacceptable” anyway? Well, the way I see it, I need to stop looking at it through my eyes, and try to see it through God’s. When Jesus walked the earth as a man, He had this amazing ability, a perfected skill, really, to see through words and outward appearance and read the intent of the heart of people. That is why, when people approached Him to ask Him things, He did not simply reply to the words, He replied to the person’s heart. So he healed the servant of his enemy, a Roman Centurion; He silenced the voices (many times) of the small group of Religious Leaders that tried to entrap Him, He ministered to people that were targets of His own people’s racism, and He remained silent through His illegal trial and prosecution. Doesn’t Jesus still do this? I believe that God would answer the question, “Is it unacceptable” by doing exactly what Jesus did when He walked the earth – look past the outward and read the intent of the heart. If I, by deciding to “enter in” to worship and be physically demonstrative, am showing obedience and love for God, (“I don’t care How I feel, I love God so much, I have to worship Him because He deserves it”), then you better believe he accepts it. In fact, I think that kind of worship holds some extra power in it. But if I, by behaving in that way, am doing so to try and hide sin, or hide my distant relationship with God, or make people around me think I am spiritual… then I think God looks at it and sees it as “unacceptable” – it is a sacrifice with a blemish. It is not pure, not honest, not genuine. Do I only get demonstrative when I am happy, or things are going my way? Do I only get demonstrative when my favorite worship song or hymn is led? Do I only get demonstrative when a song is led that touches my feelings because of what I am going through? Do I only get demonstrative when 4 songs have already been led, and now I am finally connecting to God? In other words, am I making this about me – what I feel like, what I want, what I think God needs to give to me? “Feed me, God – feed me, worship leader, and then maybe I will respond…” – is that where my brain and heart are? If so… then I need to be alarmed – my worship just might be “unacceptable” – because it is not pure and without blemish or defect. It’s a mess. Do I get demonstrative no matter what I feel, happy or sad or in between? Do I not wait for the team to play “my jam” before I show worship to God, but rather, connect to God right from the start? Do I not worry about who is leading or what the words say before I sing them out loud? Do I simply show love and praise to God because He deserves it? He exists, and all of creation worships Him. I exist, and I am (as a human) the greatest of God’s creations (so are you), so should I not give God the greatest of worship? If so, then my sacrifice of praise is definitely acceptable. This does not deny the reality of my feelings when things are going rough for me. Rather, it is an acknowledgment of Who God is no matter what is going on in my life or the world. 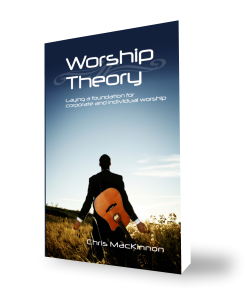 I have been a worship leader for 25 years. I have led worship when I have felt the closest to Jesus than I ever had in my life (it’s easy to lead in those times), and I have led worship when I felt like God didn’t want to have anything to do with me anymore, and I didn’t blame Him. (It is a crappy feeling to try and lead in those times.) I know what it’s like at both extremes and all in between. But I need to take the whole title of “Worship Leader” and set it aside, and just be a “Worshipper” to answer the question, “Is it unacceptable?” I need to “enter in” and show praise to God no matter what song it is, (well, there is some weirdness out there, I’ll share stories some time), no matter who is leading, and no matter how many songs have already been led. I should never wait for 4 songs before I finally connect. I should never wait for my favorite before I enter in. I should never allow my immediate feelings to dictate when and how I show praise to God. I just need to do it.